Discussion in 'Star Wars Costumes and Props' started by Riv, Mar 17, 2006. This popped up over in a discussion on the RPF, and it got me thinking: Has anyone identified the chest/cabinet that Obi-Wan uses in ANH to store Anakin's saber? I'm assuming it must have been a pre-existing piece of furniture- I'm thinking for something so trivial it wouldn't have made sense to custom craft one- but I could be wrong, of course. Has anyone done any research into this piece? I did some searching for pre-existing threads but came up empty. If there is one, please feel free point it out and kill this one. I'm at work so I can't post screengrabs, but will try and scrounge some up when I get home if no one has any. The chest was used in Superman. Lex Luthor stored cryptonite in it..
Is this now property of Lucasfilm or on display in someone else's Star Wars collection? What's the history behind that photo - did the trunk tour as part of an exhibition? I figured there must have been some information out there already, I just hadn't found it yet. Interesting. So it showed up in Superman as well? But that was post-ANH, so I wonder if it was used in anything else prior to SW. If it were a studio prop, I guess that implies it was custom made for some movie at some point, and just got shuffled about- rather than being a found item anyone might be able to go to a local thrift shop or antique store to find. Somewhat of a shame. IIRC that photo was taken at Walt Disney World at Westside Downtown Disney, There was a display there in 2003/04 in a store called Starabilias. The items were not for sale in the display. I asked. It's pretty close...couldn't find anything apart from the thickness of the "X's" and the extension of one of the limbs of an X....hard to tell though...it articulates properly, same irregularities on the sides of the lid, etc....could be a casting? My mother has a chest just like that at home - a very common eastern design - you could pick one up very easily. Looks like something from Pier 1 Imports. Can you post pics and state from where she might have gotten it? 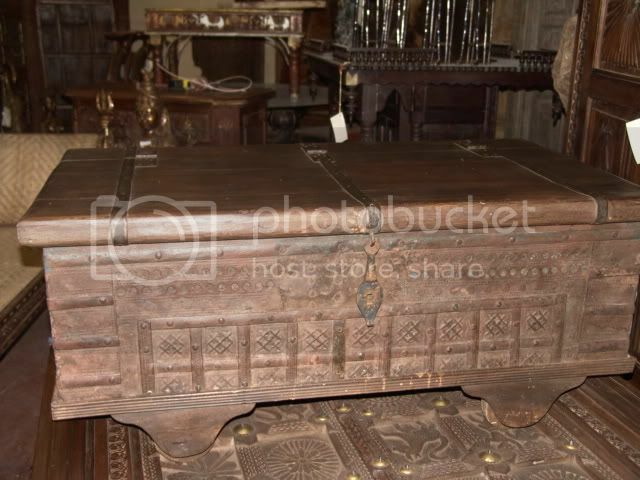 THe style to this Indian chest looks pretty similar. Have no idea who the original maker is though. The second image is from a current Ebay auction. I'm not sure if the Ebay post would apply here considering it's not exact but type in "indian trunk" and you should find it. It's close design-wise and the seller might know of something similar that we're looking for but I haven't contacted them about it yet. I'm not taking seedy pictures of my mother for you.